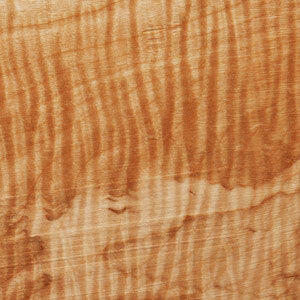 Fiddleback Maple, also known as Tiger Maple, exhibits a unique depth and dimensionality that sets it apart from other figured woods; its waves are more dense. In addition, the coloration of Fiddleback's figured stripes and lines can vary dramatically, based on the incident angle of the light. As the lighting angle changes, it's almost as if the wood is alive: the dark stripe becomes a light one and the light stripe becomes dark. This alternating series of bright and dark stripes that blend into one another as the wood is slightly moved, produce a highly prized three-dimensional illusion. Fiddleback Maple, like Curly and Quilted, is traditionally used for musical instruments - guitars, violins, mandolin - as well as fine objects like jewelry boxes and special bowls. Les says, "Fiddleback Maple dyes and stains beautifully."